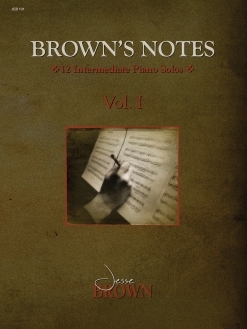 Brown’s Notes, Volume 3 is a collection of eleven early-advanced piano solos by Jesse Brown. 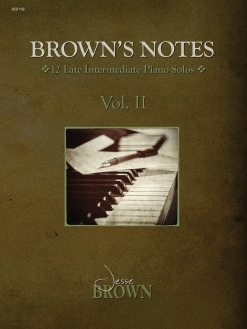 (Volume 1 is geared toward an intermediate level and Volume 2 is for late-intermediate pianists.) 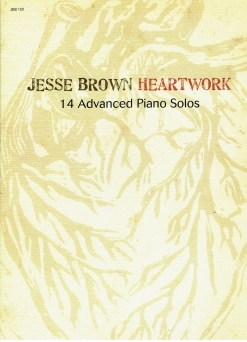 Jesse Brown is a piano teacher himself and owns his own Music’scool studio in Saskatchewan (Canada). He has also recorded and released two full-length albums and two EP’s of original piano solos, all of which I love. 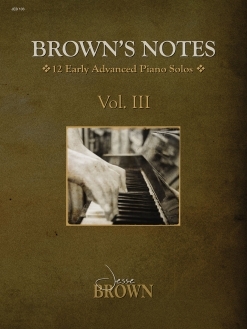 I also love these books, which contain a wide variety of musical styles that introduce students and advancing pianists to aspects of music that are not often covered in other teaching materials. This exposes budding artists to styles of music beyond classical and pop, including blues, several forms of jazz and rock, and new age. This collection seems to focus most on interesting but somewhat complex rhythms and introduces a few time signatures students may not have encountered before - 7/4, 7/8 and 12/8. Within those pieces and others, Brown brings in rhythmic elements that need to be counted - there is no faking it to get these right! I really believe that when the music is fun to play, students are more likely to put in a little more effort to learn their lesson assignments correctly. As I was playing all three volumes, I was thinking that several pieces would be great recital pieces for my own students. Of the eleven pieces, some are fairly straight-forward, but I really enjoy that Brown adds some clever playing instructions like “Vampirically,” “Blasphemously,” and “Make it funky!” The books are stapled and in the 8 1/2”x11” format. The layout is very well-spaced and easy to read. My only complaint is that one piece (“Good Winter”) makes extensive use of left hand tenth chords and I have only rarely had students who could reach a tenth (I can’t, either!). However, it does give the teacher the opportunity to talk to students about tenths and some of the work-arounds they can try - rolling the chords (works in a lot of pieces, but doesn’t fit all styles of music), playing the top note of the tenth with the right hand (cumbersome, but it works! ), moving on to another piece (just kidding! ), etc. I highly recommend this book as well as the other two volumes of Brown’s Notes. They are available from www.JesseBrown.net and www.debrawanless.ca.